Are you drinking alcohol sensibly and safely? Alcohol-related deaths are higher for both men and women and liver problems are on the increase across Northern Ireland. So as we head into the festive season once more, there will be an inevitable rise in alcohol-related cases at Emergency Departments in local hospitals. As alcohol is related to over 200 medical conditions, the Chief Medical Officers revised their guidance for alcohol consumption in 2016 in an attempt to reduce alcohol-related harm. Yet despite these efforts, Northern Ireland has a higher proportion of adults who exceed their recommended daily limit for alcohol than in the rest of the UK. With over 150,000 people attending the Downe, Ulster and Lagan Valley Emergency Departments every year and approximately 80% of these attendances, particularly at the weekend, being in some way alcohol-related, there was a need to address this issue. Aileen Drillingcourt, Substance Misuse Liaison Team Lead, with Roisin Devlin, Lead Nurse and members of staff from the Ulster Hospital Emergency Department and the Ambulance Service launch the Pop Up initiative to help improve alcohol use awareness. 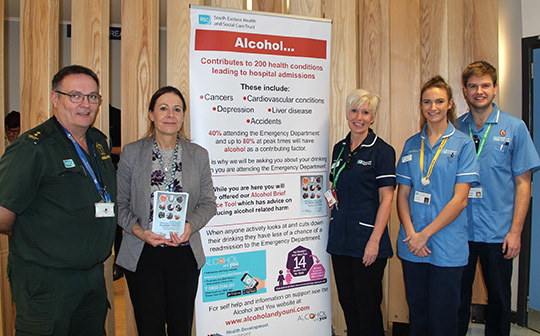 To make a contribution in addressing this concern, Alcohol and You are launching Pop Up Stands in the three Emergency Departments across the South Eastern Trust that are aimed at informing the public on where and how to access support when excessive drinking is a contributing factor affecting their health. The Pop Up Stands will inform those attending the Emergency Department that they will be asked about alcohol and offered an Alcohol Brief Advice Tool while they are there. The Advice Tool was developed by staff from the Trust and the Alcohol & You Partnership (The South Eastern Trust, ASCERT and the Public Health Agency). In the Advice Tool is a screening tool to help people look at their drinking, advice and directs people to a menu of options for support, the easiest being the Alcohol and You website which has a self-help section. Ed Sipler, Health Development Specialist for Alcohol & Drugs in the South Eastern Health & Social Care Trust said: “We all know our Emergency Departments are under enormous pressure. We believe this advice tool will not be a quick fix, but it will contribute to helping people drink less. 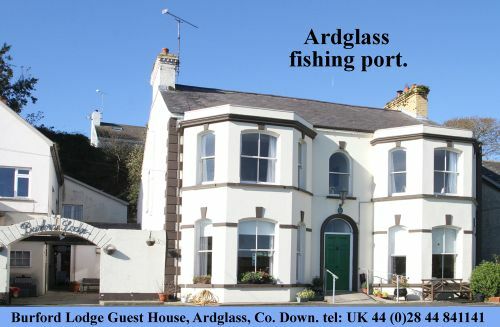 www.drugsandalcoholni.info for services near you”.